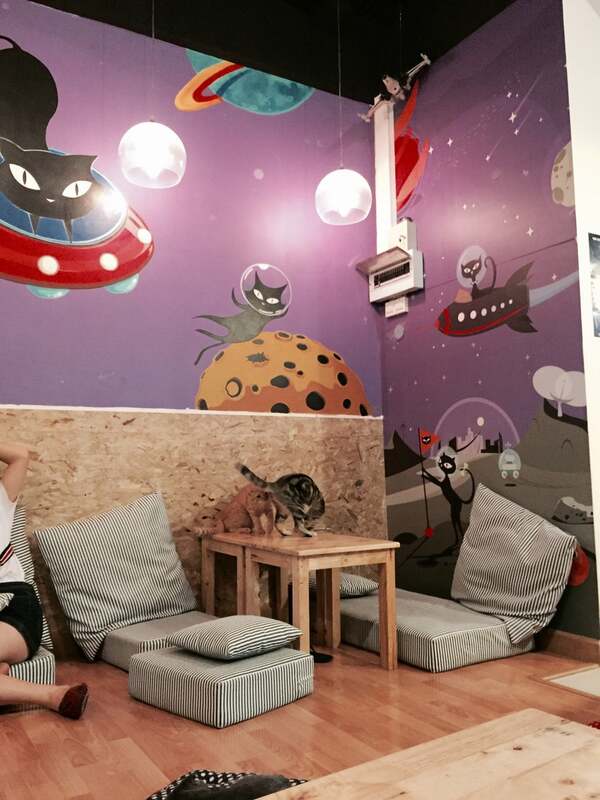 Catmosphere is a space-themed cat café. This café is a tribute to all those brave cats who have dedicated their lives to space exploration. 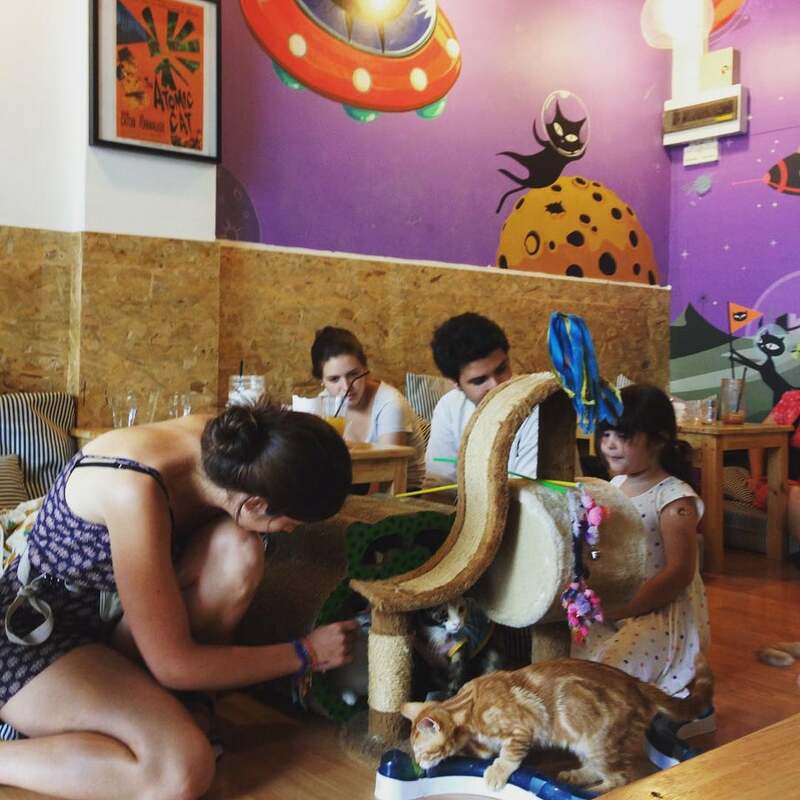 Why Catmosphere Cat Café is special ? Catmosphere is a space-themed cat café. This café is a tribute to all those brave cats who have dedicated their lives to space exploration. It features decoration and art by several artists from Thailand and abroad. Visitors can enjoy served high-quality local coffee, home-made dishes and pastries. And of course play with lovely cats. How to get to Catmosphere Cat Café? Catmosphere is within easy reach from Maya Mall and the Chiang Mai University. It is on Huay Kaew Road towards the direction of the Chiang Mai Zoo and Doi Suthep. From the old town it is a good 45 minute walk, however if you are around Nimman Road it is easily walkable in 20 minutes. You can spot Catmosphere as you see the Mac Café on the corner of the street as the café sits in the same row of shops just a little further back from the main road. The café can be reached by scooter or a red Songthaew. You should bring plenty of cash because this cafe only accept cash. You can bring your camera to caught the nice view of the lovely cats. You should wash and disinfect your hands before entering. Pets from outside are not allowed in. You should take off your shoes and use the slippers provided. Cats can be petted and played with,but some of them don't like being picked up. Please ask their staff when in doubt. You should order something during your stay in this cafe. At very busy time they may limit the maximum staying time to 2 hours. You just need to make sure your kids are respectful of the cats and the other people there. If you should go there early, because if you don’t you will have to wait outside. Visiting is free if you purchase something, otherwise there's a 100 baht fee. Cat lovers this is the right place for you!! Those lil creatures are just adorable! Meow! Try their thai tea cake! Omg! Is super awesome and beware of those meow to take a bite! We had a really fun and enjoyable visit at the cat cafe! We arrived early as recommended, to avoid it getting busy. Only two others were already there at 11am. As it got closer to lunch, more people were coming in. The cats didn't seem too cuddly, they probably feel completely overstimulated at times, but they were fun to watch playing with toys, each other and finding places to snooze. Some sneaky kitties will try and check out what you're drinking or pinch your straw! If they do eat or drink your items, you can't get a refund or replacement, so watch your food! The iced chocolate was delicious (and huge!). All the iced drinks are served in huge glasses, I felt SO full afterwards. Visiting is free if you purchase something, otherwise there's a 100 baht fee. You have to wash your hands, sanitise and put on slippers before you go in. The staff were very quiet and don't really interact with you. Would be nice to see some smiling faces or some light banter. But you kinda feel on your own with that. Would be nice to have some savoury snacks to enjoy for morning tea. Only saw a small selection of cakes. Loads of drinks to choose from but a little more snacks/foods would be nice!